I've finished quilt No. 6 of 2017 yesterday... Barcode Chic (originally chic barcodes I tweaked it a little after the initial post). 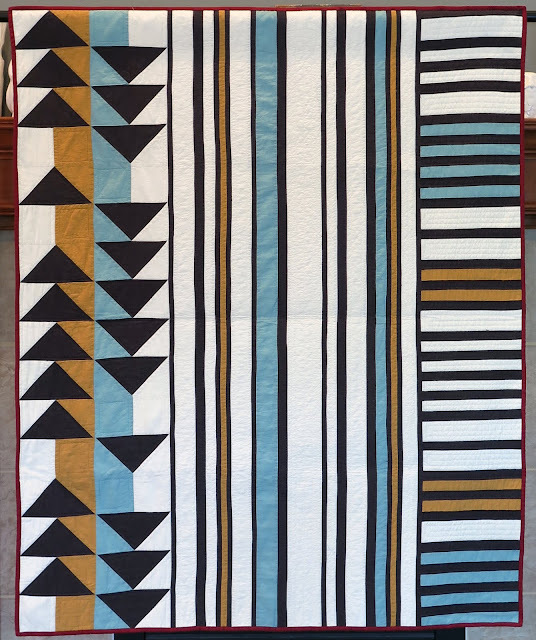 This was a slight, very slight, departure from the quilt I usually design. It's still geometric but less structured. I even used shot cottons so give it more of an organic feel. While I've made quilts before with shot cottons I don't think I will use them again anytime soon. No matter how much I cleaned up the loose threads I still ended up with shadowing and rogue threads after sandwiching, ugh. 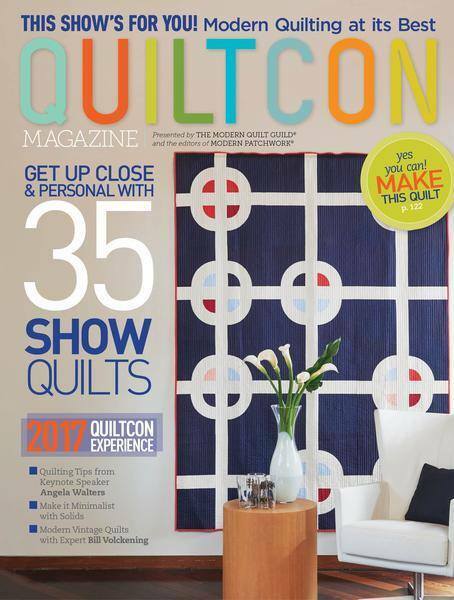 I'm very pleased to announce that Quiltcon Magazine is available for pre-order at the MQG shop! I can't wait to see all the quilts especially since I can't go to the show. 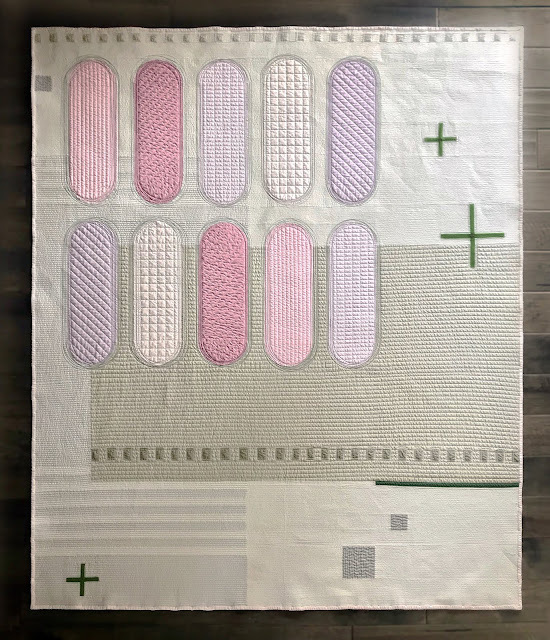 After the Modern Quilt Guild Showcase at Quilt Festival in Houston, TX I was asked if I would be willing to share my quilt Modern Stepping Stones in Quiltcon Magazine and of course the answer was YES! 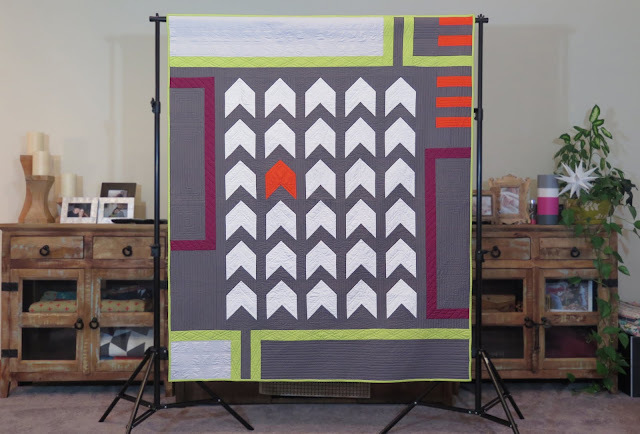 Obviously, I really liked the design, I bought it right, and it hit me one day that I could make a quilt like that. So the first step was to stop and think about what I liked about the design. For this piece it was the uniform repetition of the cars and the limited high contrast color palette. After determining what I liked I started with a simple design then added some fancy boarders. I posted this design on Instagram and got some very good feedback along with several comments say "it looks like Orla Kiely!" 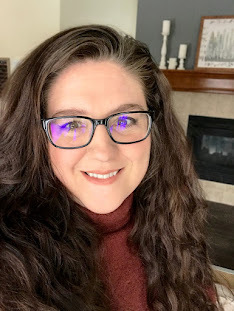 At that point I knew I needed to change up the look in order to make the design an inspiration and not a copy.